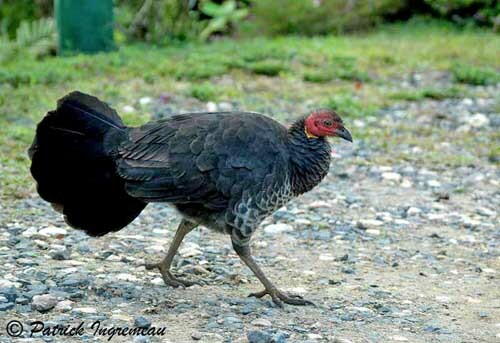 Australian Brush Turkey is one of the three megapodes living in Australia. Adult male has deep blue-black plumage on upperparts, wings and tail. Large tail is fan-like, laterally flattened. Underparts are paler. Breast is blackish slightly streaked with pale grey. Belly and vent are brownish to black, with greyish feather edges. Head shows bare red skin until half neck. Neck base and throat show yellow wattle, a kind of pouch (which is pale blue in northern birds). Male has almost entirely bare head. This pouch enlarges during breeding season, and male has brighter colours on the head. Strong, hooked bill is black. Eyes are pale yellow. Strong legs and powerful feet are dusky yellow to brown. Female is similar to male, but we can see small dark bristles on the bare head and neck, and wattle is smaller. Juvenile has brown plumage, speckled with black. Bill is short and black. Eyes are brown, as legs and feet. Young are similar to quails. Little by little, it loses the head and neck feathers, and gets the bare skin which is deep pink coloured. Australian Brush Turkey lives in eastern Australia, from Cape York Peninsula to region of New South Wales. Northern populations live at higher elevation, and some of them move to lowlands in winter. Southern populations are common in both mountain and lowland areas. 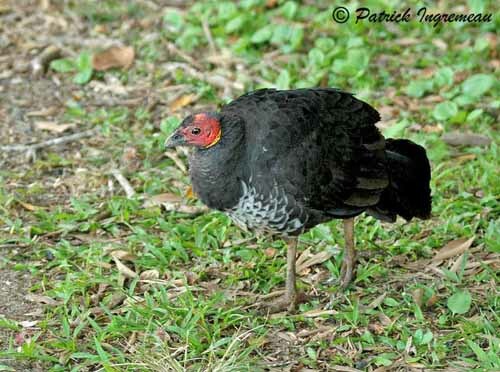 Australian Brush Turkey feeds on ground by raking leaf litter. It is also able to break open rotten logs with its large feet. Occasionally, it feeds on ripe fruits in trees. It forages throughout the day. It can run easily, and only takes off for perching in trees. Australian Brush Turkey spends the night at communal roost in tree. But it is solitary bird in nature, and it can be aggressive to each other and to other smaller species, mainly during mound building. It is wary, and quickly darts for cover if alarmed. Birds living near picnic areas are quite tame. Australian Brush Turkey prefers to walk or run, but it only takes flight for avoiding danger, and perching in trees for roosting. It rarely flies. Breeding season occurs from August to December, but also at any time, and may be variable. The nest, or mound, is usually built in dense vegetated area. Male builds a mound on the ground. This mound is made with decaying leaf matter and earth, and male adds or removes some materials in order to keep it at constant temperature of 33°C. This mound can be very large, with two to four metres in diameter, and one metre in high. Male builds it by scratching up the earth and plant matter with its powerful feet. Mound is re-used each year by dominant male in the best locality. Some males may have several mounds, but usually, one male has single mound. Male and female meet briefly at mounds, and copulation occurs. Female visits and lays eggs in mounds of several males. She does not provide any parental care after laying. Several females lay their eggs in this mound. We can find up to 50 eggs in the same. Eggs are laid in intervals of 2 to 3 days. Female digs a hollow into the mound, lays her egg, and scratches nest materials over it before to depart. Each female may lay 18 to 24 eggs per season. Incubation lasts about 50 days, but neither the female nor the male Turkey incubates the eggs. The heat provided by rotting plants incubates them. Constant temperature of 33 to 38°C is maintained by male which digs holes in the mound, in order to insert its head and check the heat. It adds or removes plant materials if necessary. But before hatching, several eggs are eaten or destroyed by burrowing predators. However, after hatching, precocial chicks are able to burrow out of the mound and they defend themselves. Chicks are completely feathered and able to walk immediately. And they can fly a few hours after hatching. Australian Brush Turkey feeds on the ground by scratching with its strong feet. It feeds mainly on fallen fruits, seeds and invertebrates. 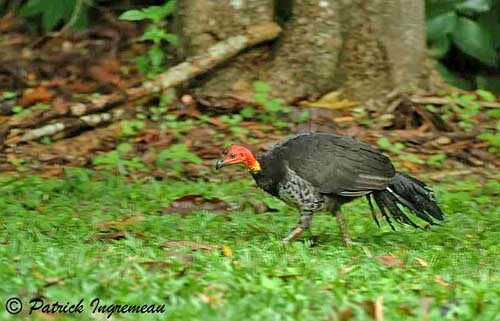 Australian Brush Turkey is threatened by habitat loss, due to clearing for agriculture which fragments remnant vegetation. Grazing reduces the density of vegetation and the leaf litter used for mounds. This species is vulnerable to introduced predators such as feral Cat and Red Fox which are chick predators. Adults are preyed upon by wild dogs. Pigs disturb incubation mounds. Availability of sheltered areas is reduced and makes easier the movements of open-habitat predators such as foxes. 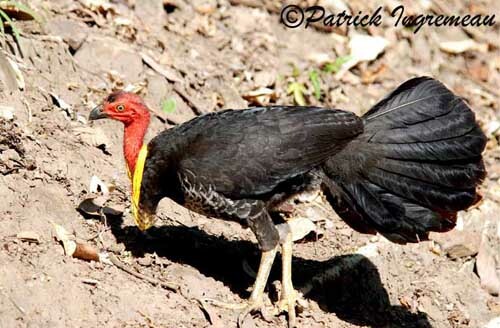 However, Australian Brush Turkey is common and fully protected in its habitat. Orange-footed Scrubfowl (Megapodius freycinet) with dark grey to brown plumage, and bright orange legs and feet. 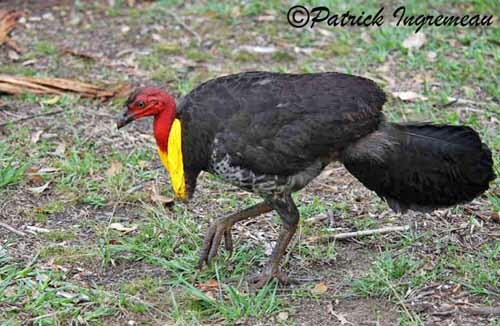 It lives in the northern part of the range of Australian Brush Turkey. Malleefowl (Leipoa ocellata) is brown, barred with black, white and rufous. It lives in southern and south-western Australia. Australian Brush Turkey utters varied harsh grunts. Male may boom at nest, in territorial display. It is a deep three-noted call, produced by inflating the wattle with air. 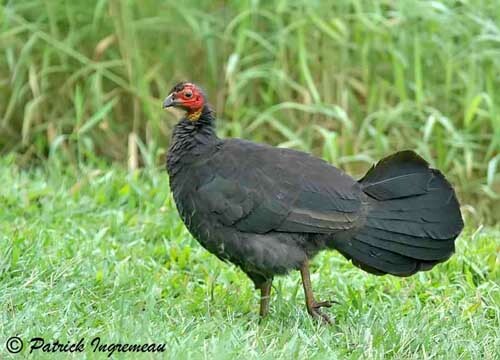 Australian Brush Turkey lives in upland rain forests above 300 metres, and in wet woodlands near coasts, and can be seen in drier scrubs further inland. This species also frequents urban wooded areas.